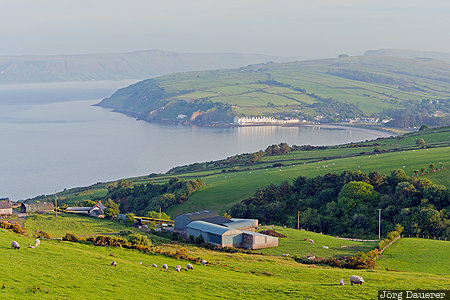 The white houses of Cushendun behind the green meadows of the Causeway Coast in Antrim and the Irish Sea. Cushendun is in Northern Ireland, United Kingdom. This photo was taken in the evening of a sunny day in June of 2016. This photo was taken with a digital camera.